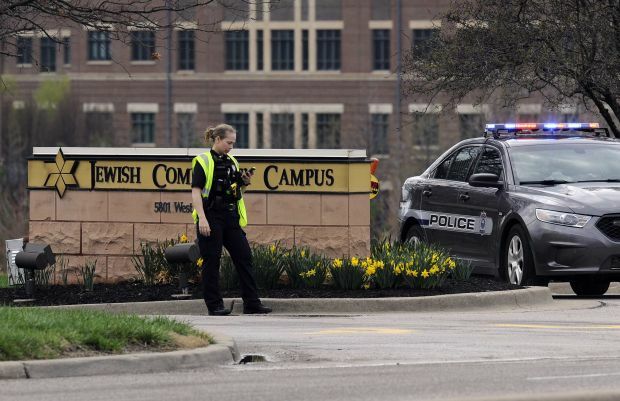 UPDATED – OVERLAND PARK, Kan. (CNS) — Outpourings of grief and support came in response to the murder of three people at two Jewish-run facilities in the Kansas City suburb of Overland Park April 13, the day before the Jewish feast of Passover was to begin. Although none of the three dead were Jewish, local police and the FBI labeled the killings a hate crime the day after the shootings. A former Ku Klux Klan leader with a history of anti-Semitism was charged in connection with the killings. One of the dead was a Catholic woman, Terri LaManno of Kansas City. She was at Village Shalom, where Frazier Glenn Cross, according to police, headed after allegedly shooting a doctor and his teenage grandson at the Jewish Community Center of Greater Kansas City a mile away. LaManno was a member of St. Peter Parish in Kansas City. Her identity was released midmorning April 14. Her mother lives at Village Shalom, an assisted living residence near the community center. The married mother of two college-age children, LaManno, 53, worked an occupational therapist at the Children’s Center for the Visually Impaired, according to the Kansas City Star. The newspaper reported that a rosary was said for LaManno after Mass April 14. “I express my deepest condolences to the Jewish community for the unspeakable act of violence that occurred on their campus on Sunday,” said Archbishop Joseph F. Naumann of Kansas City in an April 13 statement. “Our prayers also extend to the Methodist Church of the Resurrection for the loss they feel as a congregation, and to all the families who have experienced pain, sorrow and loss because of this event,” Archbishop Naumann added. The other two victims, Dr. William Lewis Corporon, 69, and 14-year-old Reat Griffin Underwood, were members of that congregation. “I will remember all of you as we enter this prayerful time of remembrance — Holy Week and Passover,” Archbishop Naumann said. The American Jewish Committee lamented the killings in an April 13 statement. “Our hearts go out to the victims of this heartbreaking tragedy,” said AJC executive director David Harris. The Council on American-Islamic Relations, a Washington-based Muslim advocacy group, said U.S. Muslims “stood in solidarity” with American Jews in the wake of the attacks, which also critically wounded a 15-year-old boy. Underwood had been driven by his grandfather to the Jewish Community Center so he could audition for an “American Idol”-style competition called KC SuperStar. Cross, 73, who also has used the name Frazier Glenn Miller, or simply Glenn Miller, was caught by a television camera shouting “Heil Hitler!” inside a police car after his arrest. An April 15 AP story said that Cross was charged with one count of capital murder for the deaths of the 14-year-old and his grandfather and one count of first-degree premediated murder for the killing of LaManno. Cross was being held on $10 million bond and was to appear in court the afternoon of April 15. When he heard about the Overland Park shootings, Pittsburgh Bishop David A. Zubik said, “I felt sick: Not again. Not ever again.” For the Pittsburgh area, he said, the news was “doubly painful,” because southwestern Pennsylvania was still reeling from the stabbing rampage at an area high school just days earlier.